There is no limit to the ways that aluminum can be used in manufacturing. For example, custom extrusion design is an excellent solution for the development of both low and high volume extruded aluminum heatsinks. All of the advantages of using aluminum significantly benefit this type of application, providing top quality and practical thermal energy solutions. It is used across many different types of applications, such as cooling medical devices, lasers, and CPUs, as well as for refrigeration, heat engines, and much more. Heatsinks are extremely useful for many different industries that require efficient heat dissipation. Some examples include medical equipment, military and defense, consumer electronics, appliances, LED lighting, computers, and other types of industrial manufacturing. When it comes to the design of extruded aluminum heatsinks, the ability to create custom extrusion design profiles really matters to manufacturers. Standard extrusions are great for certain projects that don’t require customization, but when it comes to heatsinks, the product can vary in many unique ways. Different requirements are often needed to satisfy the demand for length, speed, width, height, weight, style, and even noise level. As a result, engineers need to embrace all of the advantages of using aluminum extrusion in the development of heatsinks for industry. In addition to all of these elements, there are also other styles and demands needed by various industries. While there are other methods available to manufacture heatsinks, including stamped, bonded, and folded options, all of these are much less cost-effective than extruded aluminum heatsinks. There are many reasons why a manufacturer might choose to design a larger heatsink versus a smaller version, such as its ability to dissipate heat much more rapidly for the benefit of the larger project design. Designers must be able to identify the specific needs of each product to provide a solution that will offer the best results. While there are many advantages of using aluminum for the manufacture of heatsinks, it is also essential to select the best alloy for the project. The primary alloys used in the design and production of aluminum heatsinks are typically 6061 aluminum and 6063 aluminum. Silver City Aluminum utilizes 6063 aluminum with a variety of tempers to provide our clients with the results and standards that they require. Tensile strength for 6063 aluminum can vary, based on the temper and thickness, between 19.0 and 30.0 to meet the demands of the project. Visit our Engineering section on the website to see details regarding the mechanical properties and performance ranges of 6063 aluminum. 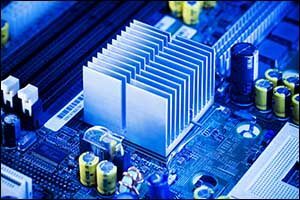 When it comes to developing solutions for the quick transfer of thermal or “heat” energy, the product requires a heatsource, a thermal compound, and a heatsink. The heatsource is thermally bonded to the base of the heatsink by the thermal compound to allow the transfer of heat to work properly. The compounds used for bonding often include particles of silver, due to the low thermal resistance of this metal. Once the compound bonds the heatsource to the heatsink, the temperature of the heatsource can be brought into thermal equilibrium with the heatsink to lower its temperature. Depending on the needs of the client, extruded aluminum heatsinks can be passive or active. A passive heatsink does not use any mechanical components, dissipating the heat through convention or the transfer of thermal energy through the use of a liquid or a gas with molecular motion. An active heatsink uses a power source, such as fans with directed fins that are integrated into the product to direct the flow of air to increase the surface area of the heatsink to cool the heatsource. The most common custom extrusion design of an active heatsink is a flat, aluminum base that features vertical radiating fins to increase the surface area for rapid transfer of thermal energy. Silver City Aluminum offers our clients a wide range of specialized services and applications for industry. Anything that you could ever dream up is a possible custom extrusion design. We do many different custom services and provide special applications for our clients. Our team of highly trained and experienced designers, engineers, and technicians have worked with a variety of different industries to create some pretty unique results. Extruded aluminum heatsinks are one of the areas that we specialize in, along with snowmaking applications, liquid nitrogen to gas exchange cold sinks, telescoping profiles, and collars for the automotive industry. If you would like to get a FREE estimate for any of the service we provide, whether for standard extrusions or custom aluminum design, our team can help you benefit from all the advantages of using aluminum to maximize the return on your investment. Give us a call at 508-824-8631 and speak with one of our team members about your needs.